Margaret Mitchell's epic Civil War story centering on the Southern belle Scarlett O'Hara. Victor Fleming (who also won the Oscar for direction). With Thomas Mitchell, Barbara O'Neil, Laura Hope Crews, Ona Munson, Butterfly McQueen, Evelyn Keyes, Paul Hurst, Isabel Jewell, Ann Rutherford, Caroll Nye, Victor Jory, Cliff Edwards, Ward Bond, Violet Kemble-Cooper, Oscar Polk, George Reeves, Eddie Anderson, and Rand Brooks. The legendary producer, David O. Selznick, produced two films that won the Best Picture Oscar: GONE WITH THE WIND and REBECCA (1940). He started as a writer, and quickly became an independent producer working first at RKO, then at MGM, and in 1936 he formed Selznick International Pictures. 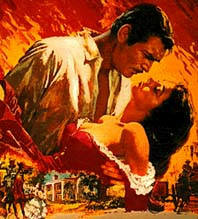 Selznick's other works include: VIVA VILLA, DAVID COPPERFIELD, A TALE OF TWO CITIES, A STAR IS BORN, THE PRISONER OF ZENDA, INTERMEZZO, DUEL IN THE SUN, and A FAREWELL TO ARMS. Produced during the depression, the film cost less than $4 million. Some consider it the greatest movie ever made, others consider it the greatest example of storytelling on film, one thing is true... it is the most popular film in history. The public demanded Clark Gable as Rhett Butler; but the nation-wide search for Scarlett went on for months, captivating everyone's interest. Memorable music by Max Steiner. It earned 8 Oscars-a record, until Ben Hur got 11 Oscars in 1959.